Our train arrived into Xi’an a bit later than we expected and our bikes much later as they didn’t turn up until the next day. In Xi’an the main thing we had to do was apply for renewals for our visas; we weren’t sure how this was going to go due to the amount of rumour and hearsay around the process. Luckily for us it went fine and we got them far more quickly than we had been led to expect. We’d been quoted from five working days to seven for Xi’an but we applied Tuesday morning and got them on Friday morning. Everyone at the PSB was helpful and the only strange part of the process was having to provide them with photocopies of our bank cards with the amount in the accounts written on as proof of funds. As it must be impossible for them to check this seemed a bit odd. While waiting for our visas we had plenty of time for sight seeing and there is a lot to see in Xi’an. My highlight was the city walls which were built in 1370 and are pretty much fully restored. They are incredibly impressive with a length of 14km and are wide enough to drive a couple of cars down. Walking on them it felt like they went on for ever and ever…especially in the heat of the day. 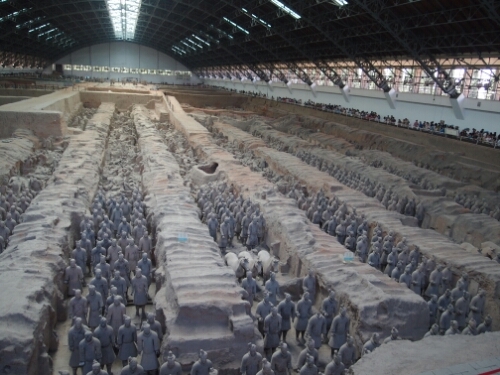 Xi’an’s most famous attraction isn’t its city walls, as it is the nearest major city to the Terracotta Warriors which are one of the most famous historical tourist attractions in China, if not the world. For me they were a bit of a disappointment, I’d been wanting to see them for many years and so expectations meant that they were always going to be a bit of a let down. The hordes and hordes of Chinese tourists also put a bit of a dampener on things as getting into a position to see anything could be a bit of a struggle. Still seeing ranks of two thousand year old pot soldiers is still impressive and not quite like anything else I have seen before. 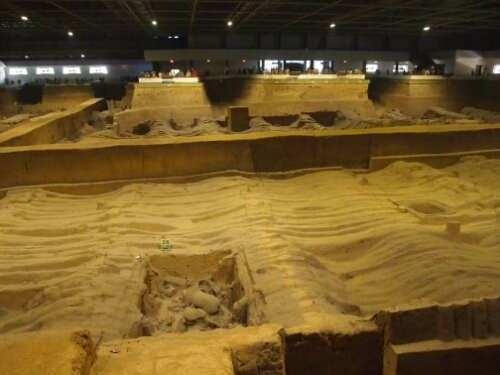 Interestingly large parts of the site are yet to be fully excavated and many of the soldiers remain unrestored. I’d like to see how it looks in another twenty years or so. In Xi’an the lens on my camera finally gave out; it had been threatening to do so since the desert in western China where some grit must have worked its way in. As it would take a few days to get it repaired in Xi’an as they didn’t have the parts I decided to send it home for repair and to get a new lighter and smaller camera for the rest of the trip. Hopefully it’ll still take pictures of a similar quality! 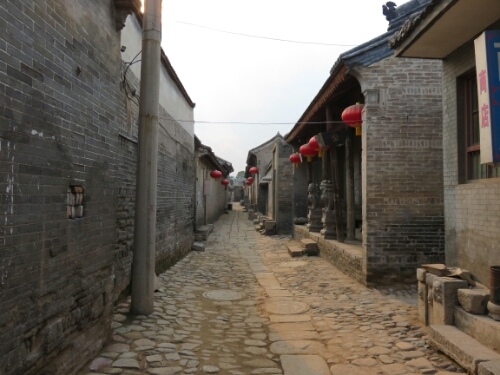 Having collected our renewed visas we headed out the next day to make for Pingyao around 600km away. 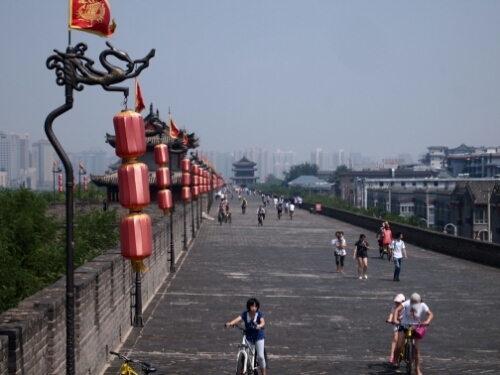 Getting out of Xi’an was a bit of an experience as it is far and away the largest city I have cycled through on this trip. It took well over an hour to even get into the suburbs which went on for much longer after that. Thankfully eventually we broke free of the city and had a pretty boring remaining day riding through very flat smoggy land. Happily it was fairly comfortable with everything we needed including wifi. I was a little worried we would get moved on by the police as it clearly wasn’t somewhere that was licenced to take foreigners. Thankfully this didn’t happen. I guess either the police are a bit more easy going in eastern China or we were in such a backwater that no police noticed us. The next day we rode off from the hotel and made it about 4km before torrential rain kicked in. We were able to make it to the shelter of a petrol station before the downpour really began and lurked there to the surprise of the attendants until the rain eased off. Thankfully it was just a freak shower and we were able to ride the rest of the day without having to waste any more time for the weather. The scenery also picked up a bit as we found ourselves riding through some hills, which makes life a bit more interesting compared to interminable flat. 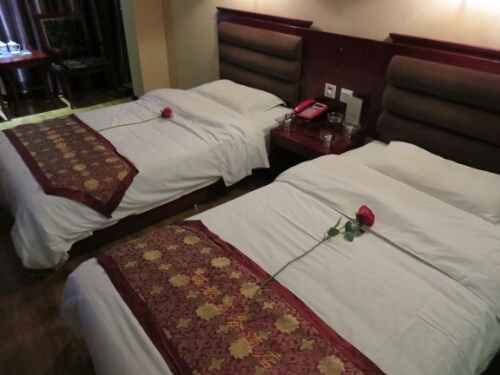 That night we found a slightly more salubrious hotel to stay in where they even put fake roses on every twin bed. We woke the next morning happy with the knowledge that we would only have to make half a day as we were headed to Hancheng a Chinese city with an Old Town that we wanted to have a look around. 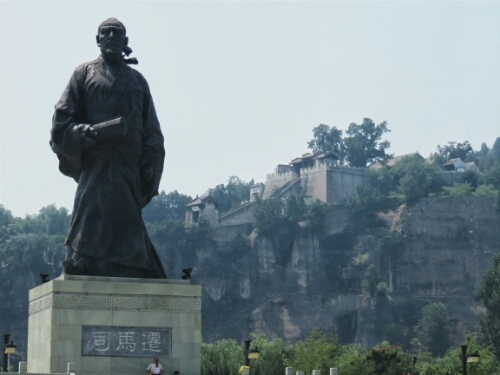 Hancheng is famous for being the home of Sima Qian a well known historian, we rode up to his memorial temple but didn’t go in as it was quite pricey. The old city of Hangcheng itself was quite interesting but was quite run down and could definitely do with some renovation. 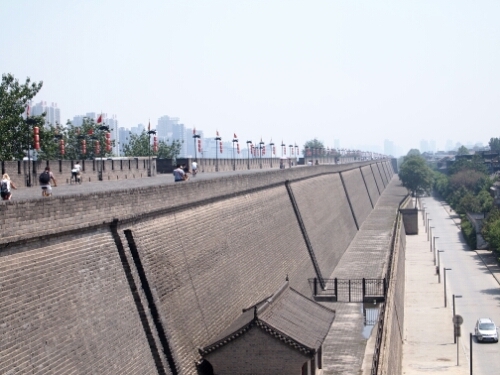 In China sometimes it is hard to see the logic in how they spend on their historical attractions. For instance at the Sima Qian memorial temple earlier they had built a lot of brand new facilities and put in quite a few new statues, which was nice but not really necessary. 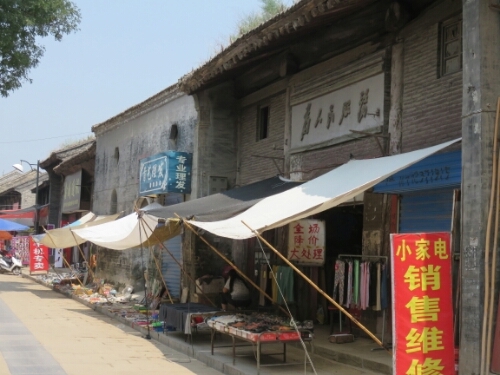 Yet a few kilometres down the road the old city in Hancheng is going to complete ruin and seemed in real need of some investment. 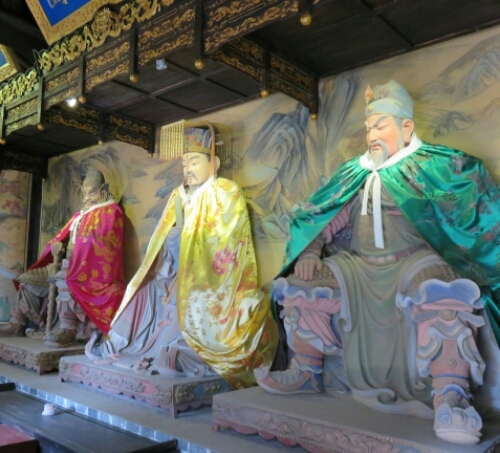 At least the temple complex part of the area was in good shape and with some funky Confucian statuary. 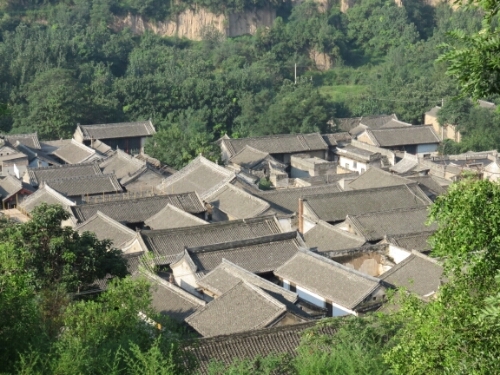 That afternoon we would ride a bit further to Danjiacun – a fairly well preserved 14th century village. It was definitely different from a lot of the villages we had been cycling through as it was all stone. There were lots of houses open to look around and it was possible to wander through the old twisty streets at will. Nestling at the bottom of a valley it felt a world apart from the breakneck development that was occurring only a few kilometres away. That night we were able to sleep in a guesthouse in the village itself, which had one of those showers where I wasn’t convinced I would come out cleaner than I went in. Its not every night you get to sleep in a 14th century Chinese village (unless you live there) so I ignored the grime and concentrated on the unusual architecture of the building we were staying in. The next day the weather remained lovely and we continued on towards Pingyao. Sadly the pollution was getting worse and worse. We didn’t just have to contend with the dust of the road but also thick smog that hung ugly in the air. We were entering more industrial areas now and it really showed. 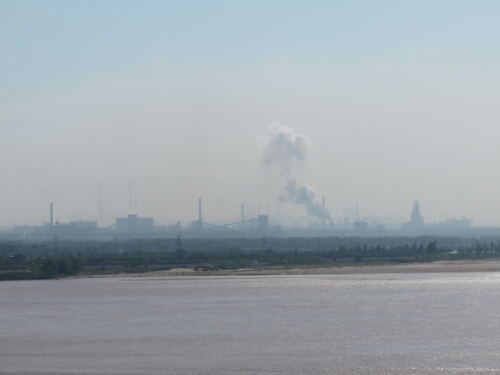 As the day wore on, while the landscape was pretty the pollution got worse. There was now a lot of coal dust in the air as well, as massive lumbering coal trucks rumbled along the road with us, spilling tiny parts of their load with every kilometre they made. The plants by the side of the road were no longer green but black. This went the same for me, by the end of the day I looked a bit like a chimney sweep, with black arms where the dust had mixed with my sweat. 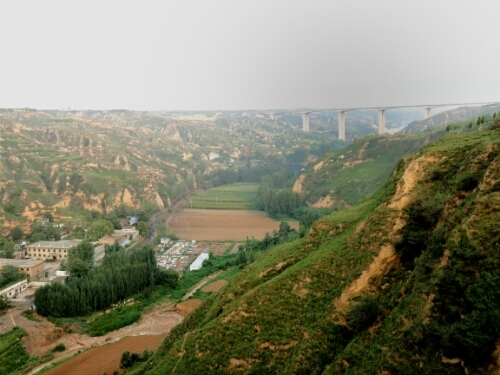 It was a long long day as well as we rode over 160km from Danjiacun to Linfen. I wanted nothing more in the world than a shower. Sadly this took a bit longer than it should have as the first hotel agreed to take us but then changed their mind when it came to actually registering us – which happens a lot. After a bit of riding we were able to find a smaller hotel that didn’t seem to be too bothered where we were from as long as we were paying. The room was one of the cheapest we had stayed in as well but also with some of the best facilities with its own computer, water cooler and a power shower. As soon as we were in the room I jumped in the shower afraid we might get the ‘sorry you have to leave’ knock. Thankfully it never came and I was able to scrub myself clean finally. That evening we bought face masks to wear when riding as we figured that all the coal dust can’t be good for the health if you are breathing it. Hopefully they will help. The next day we had another long ride and again it was with coal trucks and the disgusting dust they disgorge. The scenery was again nice but again you lose a lot in the haze – sometimes you can make out a distant mountain range but only enough to see the outline of itsshape rather than any beauty it might have. We spent a lot of the day riding through a river valley between two ridges, which would have been much more pleasant without all the trucks and pollution. 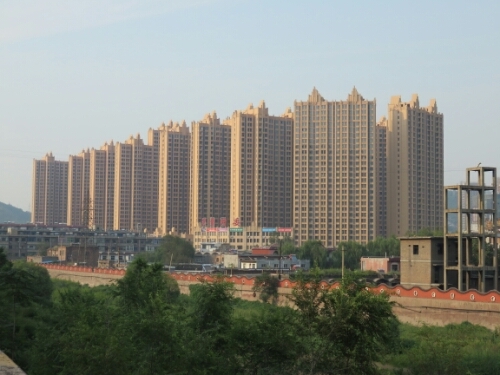 Huge new apartment blocks like the above are a common feature in China. They are popping up literally everywhere. At every town or city we have passed through there are always rows and rows of new apartments being built or that have just been finished. I see more cranes in a small Chinese town than I saw in the entirety of central Asia. Even in the remote river valley we were riding through, with very little flat land they still managed to fit some in. 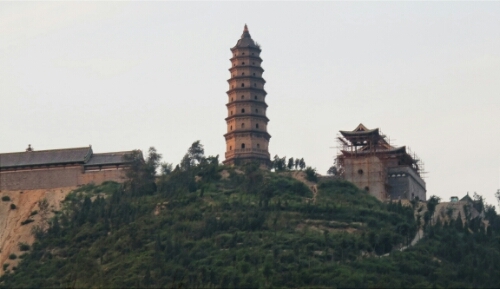 At the same time you can often see an ancient pagoda overlooking the changes that are roaring through China. 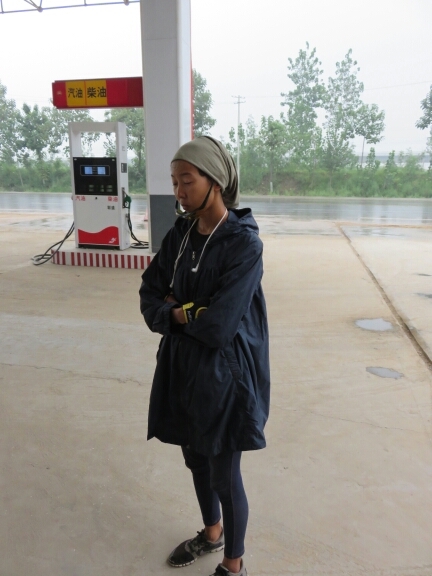 I’d hoped that night to make it to Pingyao but darkness began to creep in when we were still 30km away. 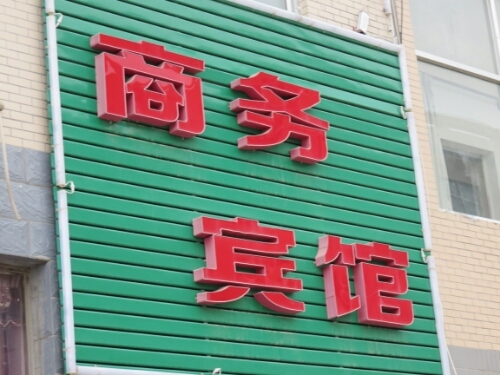 Luckily we had reached the town of Jiexiu and we were able to find somewhere to stay there. When we went into the restaurant adjoining the hotel for dinner we suddenly found ourselves the centre of attention of a table of merry Chinese guys. They came over to try and talk with us and it transpired it was the birthday of one of them. Next thing I know I am shooting strong Chinese spirits and having my photo taken a lot. They were also very curious to see money we had from our own countries. For notes we only had Kyrgyz som with us as my pounds were long gone and I had a rupee coin as well. Next we had fun trying to give them the notes as a present as they wanted to change Chinese yuan for them. In the end we had to accept the yuan in exchange as they wouldn’t take it as a gift – we got a very favourable rate! They also very kindly insisted on paying for our dinner (they explained endlessly this is what they were doing and we couldn’t make them understand that we understood) and seemed to have been very happy to have met some foreigners.